This simple Chinese-style fried shrimp dish makes a delicious party appetizer. Definitely make a double batch for a hungry crowd! In a large bowl, stir together cornstarch, 2 tsp black pepper, kosher salt, 5-spice powder, hot pepper flakes and sugar. Pat shrimp dry with paper towel. Toss in cornstarch mixture until well coated. Heat oil in wok or large skillet set over medium-high heat. 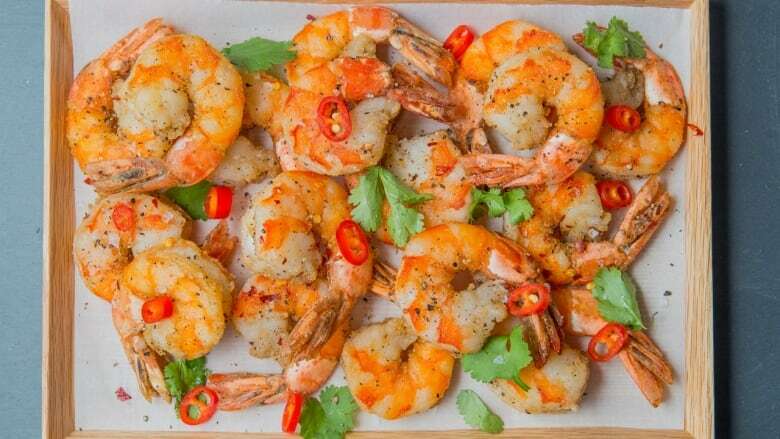 Cook shrimp in 2 batches, until they start to curl, turn pink and are cooked through, about 1 to 1 ½ minutes per side. Transfer to paper towel-lined plate to drain excess oil. Sprinkle with sea salt and remaining pepper. Garnish with chiles and cilantro if using. Serve with a squeeze of lime or lemon if desired. Serve as a dinner main over salad, steamed rice or stir-fried noodles.